The calendar year 2015 was undoubtedly not a productive one for Sri Lanka cricket with the national team undergoing a period of transition following the retirement of the last of the three batting icons Kumar Sangakkara. The previous two years had seen Tillakaratne Dilshan (in 2013) and Mahela Jayawardene (in 2014) bowing out of international cricket after lengthy and successful careers. The last bastion Kumar Sangakkara bid goodbye to international cricket during the Indian Test series at home, thus bringing to an end a glorious cricketing career that marked him as one of the 'greats' in world cricket. The meticulous left-hander appeared in five of Sri Lanka's 11 Tests played for the calendar year - one in New Zealand, and two each against Pakistan and India at home before signing off. His farewell though momentous did not have a fairytale ending as everyone would have wanted, but finished on a more somber note with Sri Lanka losing to India by 278 runs at the P Sara Oval and Sangakkara's final contribution to his country being 32 and 18 - falling on both occasions to the off-breaks of Ravichandran Ashwin. Milinda Siriwardana and Dushmantha Chameera two exciting prospects for the future. Sangakkara had his name engraved in virtually every Sri Lankan batting record and he set a world mark for a wicket-keeper in ODI cricket with 482 dismissals of which he also had the highest number of stumpings 99. He marked his final appearance at a World cup by scoring four consecutive hundreds - a record in ODI cricket. Sangakkara's exit created a big void in Sri Lanka's batting for the number three slot which he had so diligently held on for nearly 15 years and contributed lavishly. Not only in the Tests but also in the ODIs Sri Lanka struggled to fill the hole created by the retirements of Sangakkara and Jayawardene who were a solid no. 3 and 4 in the order for many years. The two heir apparents to that throne Lahiru Thirimanne and Dinesh Chandimal had rather ordinary years although much was expected from them. Thirimanne managed just 310 runs in 8 Tests averaging 23.94 with two fifties and 774 runs in ODIs average 38.70 with century and five fifties. 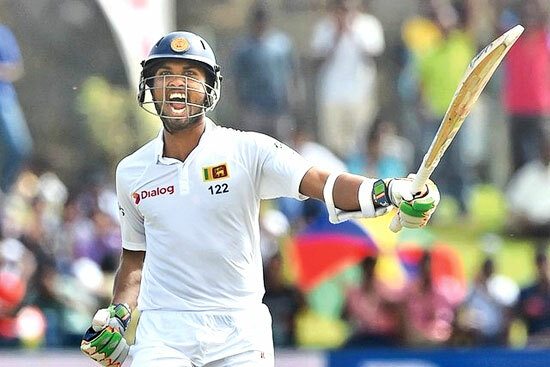 Chandimal having to bat lower down the order because of wicket-keeping duties had a fairly good run in Tests accumulating 901 runs from 11 matches, average 47.42 with two centuries and an average run in ODI cricket with 298 runs (avg. 33.11) and two fifties. The performances of skipper Angelo Mathews also suffered slightly due to the extra burden of having to shoulder more batting responsibilities aggregating 845 runs (avg. 42.25) from 11 Tests that included three centuries. Of the younger brigade opener Dimuth Karunaratne performed best scoring 761 runs (avg. 36.61) from 11 Tests inclusive of two hundreds. Dilshan who is continuing his international career in the ODIs and T20Is turned out to be Sri Lanka's most prolific run-getter in all formats by scoring over 1000 runs in ODIs in the calendar year. With one match to play on New Year's eve against New Zealand, Dilshan sported an aggregate of 1116 runs (avg. 50.72) with four centuries - the fourth time in his illustrious career he has passed 1000 runs for a calendar year. On the bowling front the most impressive development was the form shown by fast bowler Dhammika Prasad. Prior to the start of 2015 Prasad had just 34 wickets from 17 Tests in an injury hit six years. He worked himself assiduously towards getting fit and, free from injuries he became the spearhead of the Lankan Test bowling attack ending the year with 41 wickets (avg. 24.95) from nine Tests even outdoing left-arm spinner Rangana Herath who had borne the brunt of the bowling since the retirement of legendary spinner Muthiah Muralitharan in 2010. Prasad could have easily topped a half century of wickets had he not got injured ahead of the two Tests in New Zealand on the current tour. He more or less compensated for the loss of another fast bowler Shaminda Eranga who went through 2015 without playing a single Test for his country suffering a series of recurring injuries starting off with his back. 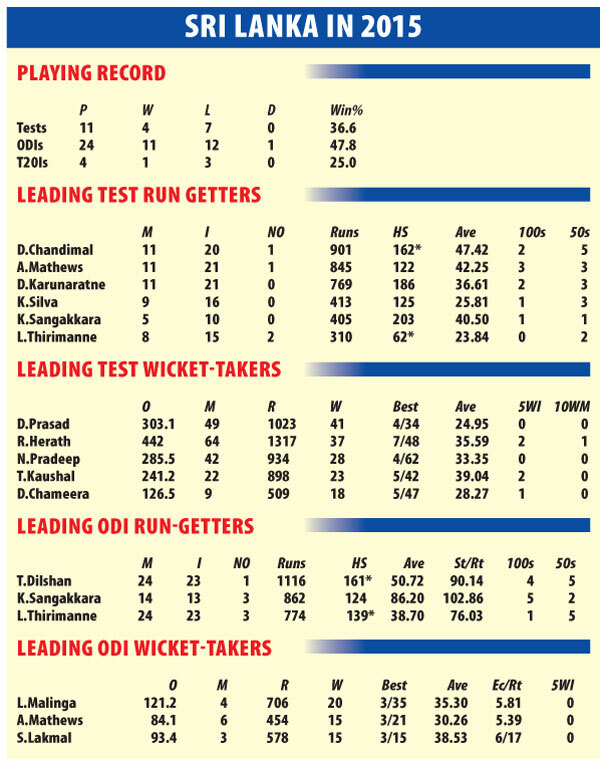 Herath not having the best of season's managed 37 wickets (avg. 35.59) from 10 Tests and even suffered the rare ignominy of being dropped from one Test when the Pakistani batsmen whom he had tormented over the years found out a ploy to counter him. Young off-spinner Tharindu Kaushal looked as if he had a promising career ahead of him and was even being touted as Herath's successor when he took 22 wickets in five Tests for the year before his world fell apart when his doosra was deemed to be illegal and was banned. In the following Test against West Indies Kaushal was nowhere as effective as he was before and the selectors were forced to drop him and recall another off-spinner Dilruwan Perera to partner Herath. It is not the end of the world for Kaushal who is only 22, he has enough time in his hands to regain his confidence and become a match-winner for his country as Herath's days of retirement are not far away. The 37-year-old veteran is battling fitness to keep himself going against recurring knee problems. The emergence of Milinda Siriwardana as a left-handed all-rounder and Dushmantha Chameera as a young a fiery fast bowler are some of the positives Sri Lanka can draw from the year. A late developer Siriwardana at 30 has already displayed his talent in all three formats of the game with his free-flowing hits and useful left-arm orthodox spin. Chameera (23) is the most exciting 'find' for Sri Lanka bowling consistently at 140 plus and unsettling opposing batsmen with his lively pace and bounce. Likewise Kusal Perera who was emerging as the most exciting batsman since Sanath Jayasuriya had his budding international career on the line following a dope test taken during the home series against West Indies that turned out to be positive and saw him fighting hard to save himself. Result wise Sri Lanka did not have a good year winning only four of the 11 Tests played during 2015 and losing seven to be ranked as low as seventh out of 10 in the ICC Test standings. In ODI cricket they were knocked out of the World Cup by South Africa in the quarterfinals and overall had 11 wins against 12 losses to show from 24 matches and a ranking of five. Sri Lanka however managed to cling onto top spot in the T20I rankings despite having an unimpressive year where they won only one out of four matches (3 losses). It was not a good year for long-standing curator of the Galle International Stadium Jayananda Warnaweera who was suspended by Sri Lanka Cricket for two years from cricket, cricket management and representation after he failed to attend two interviews with the ICC Anti-Corruption Unit and also failed to assist them on alleged match-fixing investigations. Since April 1 Sri Lanka Cricket was administered by a nine-member interim committee appointed by Navin Dissanayake during his short tenure as Sports Minister to get rid of 'system corruption' at SLC. The committee headed by former Sri Lanka cricketer Sidath Wettimuny cut down severely on unnecessary expenditure and diverted it towards infrastructure development around the country. However with a new Sports Minister Dayasiri Jayasekera in place elections are scheduled for January 3 which meant the interim administration would cease to exist by the end of the year. We end this review on a rather solemn note as during the year Sri Lanka cricket lost one of its finest coaches Lionel Mendis who passed away at the age of 80. He was widely referred to as the father figure on cricket coaching in the country.